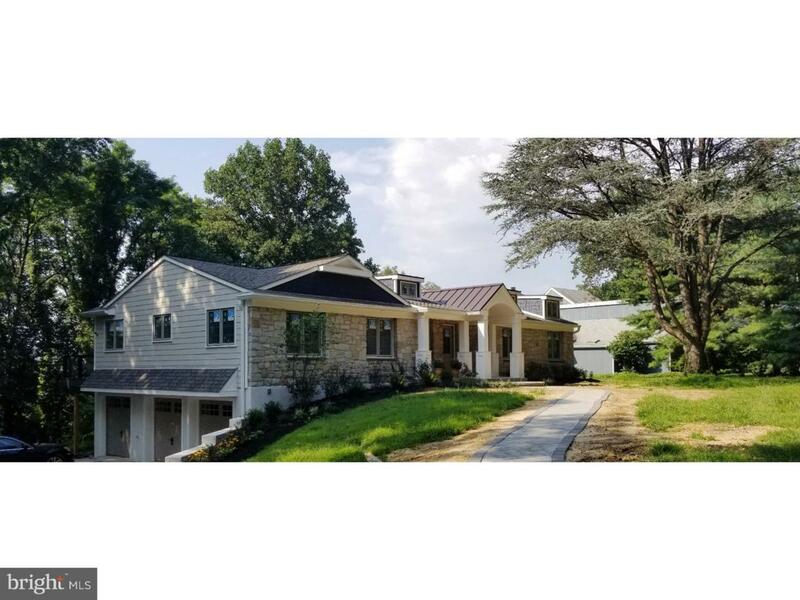 Welcome to the stunning renovated Ranch home in Radnor. Custom re-built, this home is completely renovated from the driveway to a lower level. A just finished paved walkway takes you to the house with keyless entry. 1st floor is finished with striking hardwood floors, all new doors and windows, and eye-catching touches all over. Open floor concept and added square footage connect state of the art kitchen to the living room and dining room.The kitchen's custom high-end cabinetry boasts stainless steel appliances, gas cooktop with downdraft connected externally, quartz countertops with 3 pop up power outlets with USB, plenty of storage and a walk-in pantry. The island is designed for dining that extends to the breakfast room with sliding glass doors to the deck. Backsplash tiles to be selected by the new homeowner. The private, cozy dining room is located off the kitchen. The gorgeous covered deck is accessible from both the kitchen & living room. It allows the new owners to take advantage of sitting outside in the rain while staying dry & sipping on a favorite drink. The sliding doors and windows have a lifetime warranty service. The powder room has an elegant vanity that matches the exquisite tiles. Make sure to look through the powder room window and look out on to the tranquil setting of the landscaped garden. A laundry room with "Barn" door is also located on this level. The main bedroom has added a walk-in closet and full bathroom with white marble shower, bench & double vanity. A linen closet for towels makes it easy to reach for a clean towel. The two additional bedrooms have a higher ceiling that allows light from dormer windows to reflect in the rooms. A hallway bathroom is finished with white tile, pebble flooring, a clean, modern look & designed for easy maintenance. Step down to walk out lower level with complete privacy, 4th bedroom, entertainment room and area for library /office. A full-size bathroom and plenty of finished storage area make this lower level a private suite for in-laws, an Au Pair suite, office or a student returning from college.Lower level plumbing also offers an area to add a kitchenette or a wet bar in the future. A fitted "Mudroom" allows for easy access from the garage to remove shoes and coats. A 3-car garage provides for ample storage. Brand new roof and sidings complete the exterior. This home is protected with the Vivint Smart Home Security system to give you peace of mind. The security system allows you to control the cameras, smart lock and garage door from anywhere using the highly rated Vivint Smart home APP. Last but not least, a new french drain is installed within the perimeter of the house. Total Sq Ft including finished lower level is 3225.